Today's just some here and there bits and pieces. A reminder, a publish, and a winner :) So . . .
And the last bit today is a winner of the Slice Giveaway!!! Thank you again to Slice for sponsoring this wonderful giveaway and allowing me to share this great product. So without further ado . . . 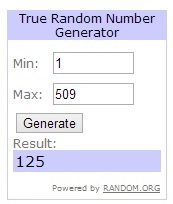 The winner of the Slice Starter Kit and Design Card of their choice is . . .
Who happens to be . . .
Congratulations to the winner of the Slice and thank you for hosting. Congrats to Cathy and thanks for the opportunity to win this! Thank you so much!! I am very excited to give it a try!!! My thanks to Slice as well!!! Congrats to CathyK! And congrats to you too, Melissa!! Have fun with the "Slice" Cathy. Melissa I'm happy to hear you're featured in one of Fav Quilt's ebooks. I luv their site.